A genuine American hero, best known for being the first pilot to fly faster than the speed of sound. This collection includes dramatizations about Chuck Yeager as a well as appearances by this amazing man. "Chuck Yeager on Bob Hope"
By any reckoning, Chuck Yeager is a genuine American hero. Best known for being the first pilot to fly faster than the speed of sound, Yeager was born to a farming family in Myra, West Virginia. As a teenager over the summers of 1939 and 1940, he participated in the Citizens' Military Training Camp at Fort Benjamin Harrison in Indiana. On Sept 12, 1941, Yeager joined the Army Air Forces as Private and became an aircraft mechanic. When he joined up, he did not meet the qualifications for pilot training, but after Pearl Harbor requirements were relaxed to meet the great need for pilots. Yeager was first assigned to fly P-51 Mustangs out England. He scored his first aerial victory before being shot down on his eighth mission. After escaping to Spain, he returned to England, only to discover that pilots who had evaded capture were not allowed to fly over enemy territory. This was to avoid putting resistance fighters in danger. An appeal was made directly to General Eisenhower, and Yeager was reinstated to full combat duty. He finished the War with 11.5 official victories, including an "Ace in a Day", downing 5 enemy aircraft on a single mission. Yeager remained in the Air Force after the War and was stationed at Muroc Army Air Field in the California high desert. His incredible flying skills along with his mechanical background from his enlisted service made Yeager a natural test pilot. 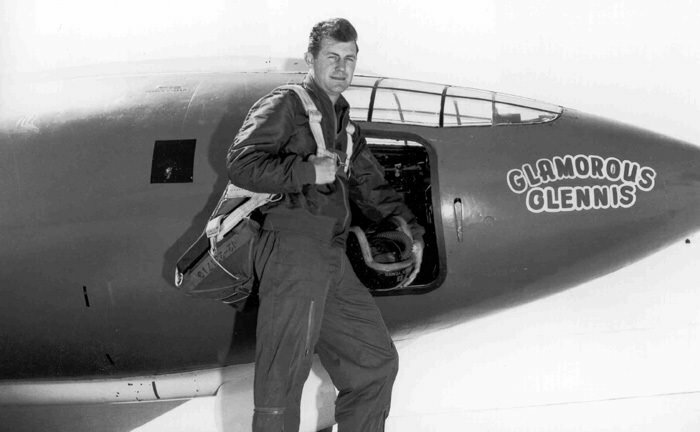 He was selected to fly the rocket powered Bell X-1 in an attempt to fly faster than the speed of sound. This historic mission is dramatized in the Hallmark Hall of Fame episode of this collection. Yeager plays himself in the production. Yeager's greatest contributions were made with his flying prowess, but he was actually a gifted Radio performer. He showed his comedic ability in a sketch when Bob Hope visited Edwards AFB in 1951. In 1953, Yeager appeared at the end of Space Patrol to describe his test work on the first delta winged fighter. Two months after this appearance, Yeager lost control of his X-1A test plane due to an inertial coupling at 80,000 ft. He was able to regain control of the aircraft, and the incident was dramatized in the movie The Right Stuff. 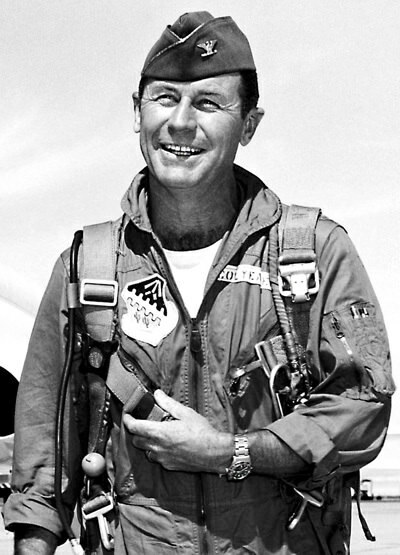 General Chuck Yeager lives in Penn Valley, CA, with his second wife. He is 90 years old. Be the first to comment on "Chuck Yeager"